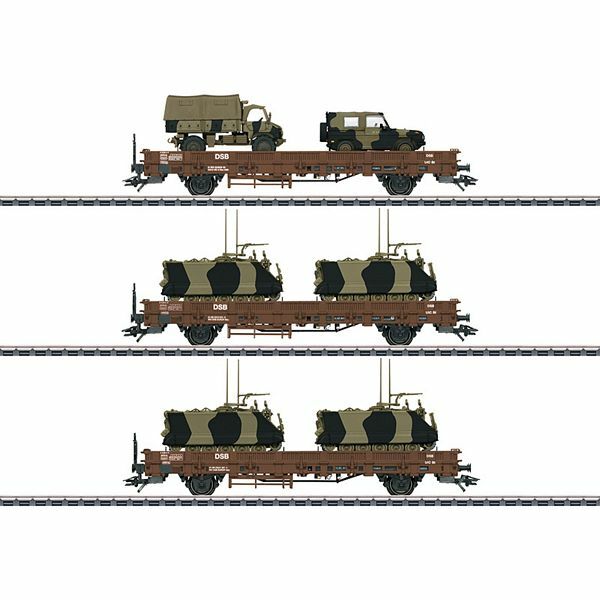 Prototype: Three Danish State Railways (DSB) type Kbs low side cars, loaded with different Danish Army vehicles. Version with a brakeman's platform. The prototypes of the military vehicles are: the light armored M113 personnel carrier, an S404 Unimog, and the Wolf gl. Model: The stakes can be removed. Vehicle restraints and stakes that can be mounted on the car are included. The military vehicles are constructed mostly of metal. They have authentic paint schemes and are lettered with identifying marks. The models of military vehicles are from Schuco. All of the models are individually packaged. Length over the buffers per car approximately 15.7 cm / 6-3/16". Total length over the buffers approximately 47.5 cm / 18-11/16". DC wheelset E700580. Military vehicles constructed mostly of metal and with authentic paint schemes.